A mom’s job is never done. As soon as kids enter your life, you can say goodbye to an always-tidy home and finished chores. From the time they’re little until the day they leave home, it’s an ongoing cycle of pick up, clean, repeat. It reminds me of that scene from Monsters, Inc. when a janitor mops the floor but leaves a trail of slime behind him. This is especially true when it comes to the highest traffic areas of the home — the kitchen and bathroom(s). Keeping those rooms clean is a necessity so any time-saving house cleaning tips are welcomed by families everywhere. Honestly, I had a major problem as I started writing this post. As a Clorox Champion (ambassador), I thought it would be a great idea to propose some time-saving house cleaning tips. Unfortunately, when I sat down to jot down some ideas, I couldn’t think of any! So, I did what any respectable blogger would do and reached out to my online community. Wow! I am connected to some seriously clever people! By compiling their suggestions with a few I found floating around cyberspace, I was able to round up some pretty awesome tips. You might notice that some points are very basic and might even seem like common sense. But, I still included them below because they might be new and helpful ideas for some. A few time-saving house cleaning tips apply to every room in the house while others are specifically for the kitchen or bathroom areas. Keep all your supplies in one place. Reduce the time needed to collect your supplies and to put them away by having them in one spot. Set aside a regular day each week. Cleaning every week lessens dirt buildup and you will have to do deep cleaning less often. Choose the same 1-2 days each week (for example, clean the bathroom(s) on Mondays and the kitchen on Wednesdays) to keep the routine regular. It’s so easy to get distracted! 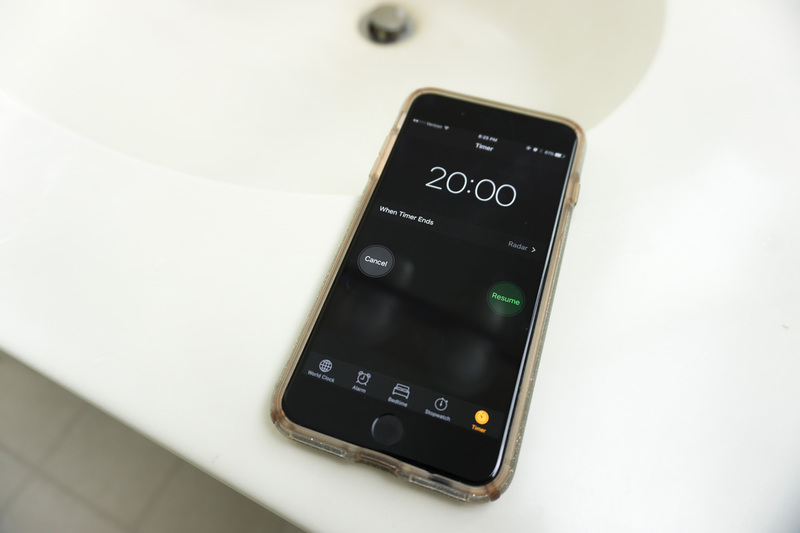 Set your cell phone timer to 10, 20, or 30 minutes and try to do as much as you can in that time. 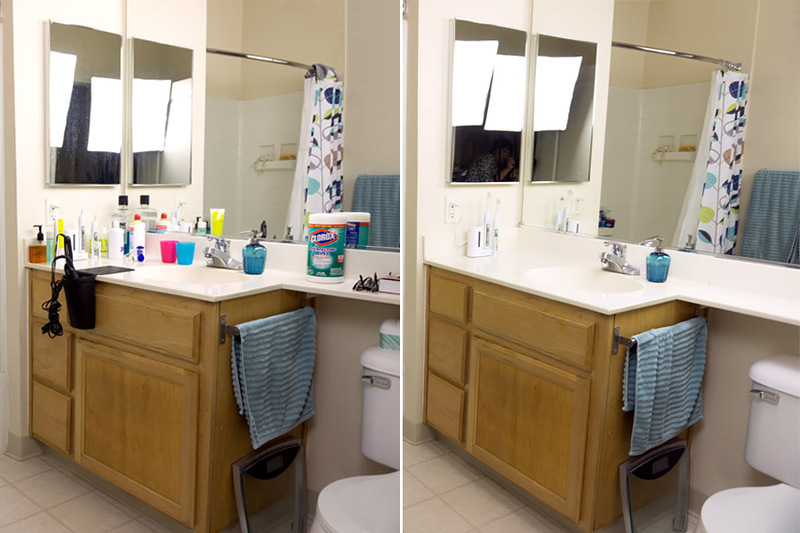 You’ll be surprised with how quickly you can clean the space! This might seem like common sense to most but there are some that need this reminder. Some dust, dirt, hair, and cleaning products will inevitably fall on the floor as you clean. So, wipe down the floors after you finished everything else and let them dry while you put your feet up for a rest. Start by soaking tougher messes. Soak cotton balls with a diluted solution of bleach and water and place on tough mildew stains. After you finish other cleaning tasks, go back to remove the cotton, wipe the area down, and rinse it. If you have glass doors around your shower or tub, use a squeegee to clear the glass every time you shower. This will cut down on soap scum and mold. Use Clorox® ScrubSingles™ Bathroom Pads. Remember how I said to keep all your cleaning supplies in one place? All you really need are Clorox® ScrubSingles™ Bathroom Pads, water, and paper towels. ScrubSingles pads are bleach-free and scratch-free. You can use them on almost all bathroom surfaces and flooring including porcelain, stainless steel, dark sealed granite, light corian, plastic shower wall, acrylic, vinyl, brushed nickel, polished brass, grout, glass, and sealed wood. You can even use the pads to clean mirrors and chrome finishes! Just add water, squeeze, wipe, rinse cleaner off with a damp cloth, and dry with paper towels. Be careful you don’t activate too much cleaser or it will take extra work to rinse it all off. Do the whole room at once. It’s much easier to clear off the surfaces, clean them, then be done with it. Plus, by cleaning the room in one fell swoop, it’s less likely that you’ll miss or forget part of it. While waiting for ingredients to toast, bake, fry, simmer, heat, or cool, wash dishes and wipe surfaces as you go. You’ll have a lot less to clean up when the food is done after you’ve finished eating. Use Clorox® ScrubSingles™ Kitchen Pads. 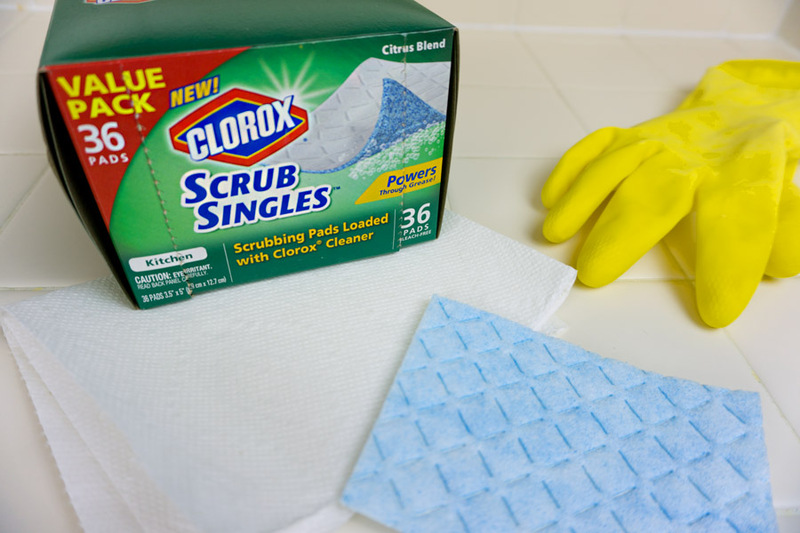 After dishes are washed and ingredients are put away, use Clorox® ScrubSingles™ Kitchen Pads. These pads are bleach free and will cut through grease on the counter, stovetop, and sink. The scrubbing surface can take off stubborn food stains. Use them to wipe down porcelain, black ceramic, mirror, stainless steel, plastic, acrylic, vinyl, grout, glass, and more. Add water to activate and wipe down the surface afterward. Don’t forget to wipe behind the microwave and refrigerator door handles! Rinse or scrub dirty dishes for later. If you don’t have time to wash dishes immediately after use, at least try to rinse and lightly scrub them. You can then pile them up to wash later or put them in the dishwasher until it’s full. Food is much harder to clean off when it dries and gets caked on. You should always cover your food when you put it in the microwave to prevent splashing. But, to clean off stray food splatters, heat a glass of water with a few drops of lemon on high for one minute. This will loosen the food, allowing you to easily wipe it off. Cleaning is just part of life and having kids means you have to do it a whole lot more often. There’s no avoiding it. Hopefully, these tips can at least lighten your workload a little bit. Do you have more time-saving house cleaning tips? Please share as inquiring minds (like mine) want to know! What time-saving house cleaning tips do you have? This post is being compensated by The Clorox Company as a part of the Clorox Influencer program and as part of my participation of being a Clorox CLXChampion.